Launched by singer-songwriter Allie Fox in 1997, it is one of the best-known little Scottish venues on the UK live roots music circuit and was voted the second best gig in the whole of the UK by the Guardian, beating Oasis. In 2007, it was shortlisted for the Scots Trad Music 'Club Of The Year' Award. Noted for its great eclectic music and its friendly atmosphere, it has hosted a veritable Hall of Fame of internationally-known musicians over the years, as well as over 800 local and semi-professional musicians who have performed in the club's now legendary and coveted open mic spots. We welcome everyone who loves music. Our audiences are noted for their discernment and listening qualities and for being very lively and welcoming. String Jam Club proves the point that a miraculous kind of magic can happen between performer and audience in a small special space and it's something you'll never forget. String Jam Club is a real experience, both for the punters and the artists, where you can see some of the greatest acoustic musicians playing live up close in a really intense and intimate atmosphere. The String Jam Club usually meets on the second Saturday of the month, but this can occasionally vary. Please check our Dates page for full gig details. Sponsored by Vixen Records, Sound Station Studio, Borders Chartered Certified Accountants and Hainingside Fine Art Photo Gallery. String Jam Club moved to the County Hotel in January 2014. 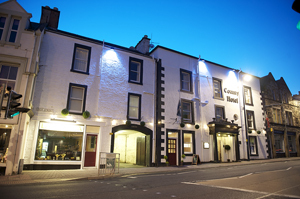 Centrally situated in the Borders town of Selkirk, the historic hotel - which dates from 1750 - is slap bang in the middle of town (in the High Street) with plenty of parking on the premises, as well as across the road in Market Square. There is also a large public car park close by. The County Hotel is the central place to meet in the town. It has an excellent restaurant downstairs if you want to eat before the show, and a separate relaxing lounge bar where you can meet up, hang out and have a drink before doors opening time.